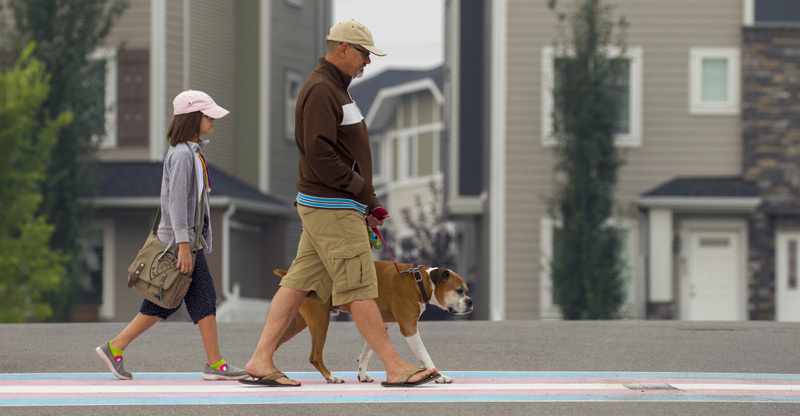 Chestermere celebrated its first Pride week with a barbecue at John Peake Park and by painting the crosswalks in front of city hall the colours of the Pride and Trans flags. “We want the community to know, the LGBTQ community to know that we all stand in solidarity of both flags of the Trans Flag and the rainbow flag,” said Joanne Mugambi, Senior Coordinator for community and neighbourhood services, in Community Services at the City of Chestermere. “We are moving from a place, we didn’t really understand what was going on, we want to understand more as a community, we want to do better and we want to cross over together,” said Mugambi. The crosswalks were painted by city staff and community volunteers on Aug. 23. The community support was excellent, especially after the painting was rescheduled at the last minute to avoid forecast rain. As Mugambi said that the crosswalks looked amazing as she watched the volunteers paint them. Pride Week came about as a response to requests from the community that the city support the local LGBTQ community. Seventeen-year-old Carmina Raposo was one of the people who helped make Pride Week in Chestermere happen. “I do a lot of activism for the LGBT Community because I’ve seen the kind of pain they can go through and I’m part of the community myself, so it means a lot to me to be able to reach out to even one person and show that they’re welcome and have a home with us,” said Raposo. Along with volunteering behind the scenes to help make Pride Week a success, Raposo wrote a letter to the CAO to request that the crosswalks be painted. “I think it’s a journey, I think it’s always going to be a little tough,” she said. It can be all the more tough when one’s peers or family aren’t understanding. “I know people in Chestermere who have been beat up by their peers for being LGBTQ,” said Raposo. Despite this, Raposo said that in her experience, it is most often family that can be the toughest on youth as they come out as LGBTQ. “Often times it’s not necessarily the community it’s the home that can be very difficult for an LGBTQ youth to navigate,” she said. While there isn’t always the support amongst one’s peers or family, having come out, Raposo, said that she has found the LGBTQ Community to be like a family. While Raposo is still coming to terms with and learning about herself, she is working hard to help raise awareness, understanding and support for the LGBTQ community. 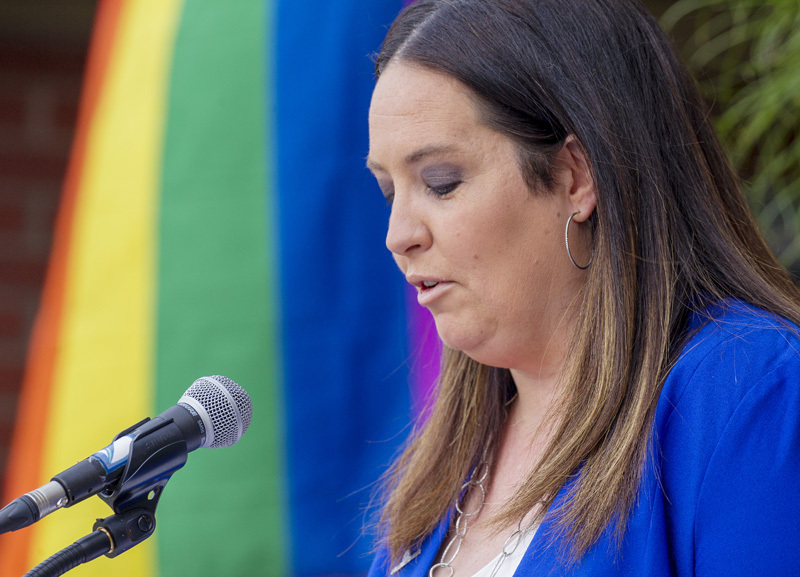 Her hope is that by celebrating Pride Week in Chestermere, members of the LGBTQ community in the city will feel a little bit more accepted in Chestermere. “My biggest hope is that members of the LGBTQ community that might not be out, might not be comfortable, might be in a really bad place right now will be able to see this and feel a little bit more at home, feel a little bit safer,” she said. The crosswalks, at the moment are an impermanent show of support as the city didn’t have the budget for the specialized paint needed for a permanent crosswalk. Depending on the weather and amount of traffic, the two flags will slowly fade away. Mugambi said that her goal is to eventually get the Pride and Trans crosswalks painted permanently.